Dr. Holakouee, why can’t these women simply say, “I married the a..hole cause I wanted to get out of Iran? …AS IN DESPERATELY!” Like many Iranian women, and some men, I have come to adore Dr. Holakouee and his noble cause in doing the impossible: healing our troubled psyche. Walt Disney once said, “It’s kind of fun to do the impossible.” Is it Dr. Holakouee? I think he’s the tower of knowledge, and wisdom in Farsi, and he’s always gracious and very consistent with his programs. But I wonder if he’s capable of doing the “impossible.” Can he build a little Disney of happiness and honesty in our heads and take out the temple of self deception? Maybe… it’s a small world after all! At every chance, I listen to one of his programs through Internet. I consider it a meditation, a cleansing of mind, a “hamoom” of mind (what he often considers therapy to be). While I enjoy the meditative state of his logic and reason, I often get disrupted with one his nuisance and bizarre callers—all of a sudden my state of calm and consciousness is interrupted and invaded and soon I find myself trapped in a “hamoom omoomie of minds.” It’s no longer about cleansing my mind, but I have to watch others clean up theirs with a painful process of kiseh keshie of lies and self deception. I can’t help get annoyed by some of his female callers, my comrades and fellow sisters. This is about one particular group that I’d like to call “mail order brides.” I say that with genuine love and admiration. 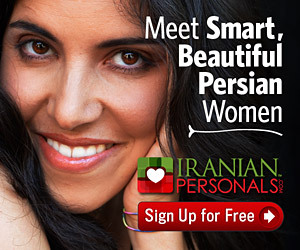 I wished we had a real amnesty programs for Iranian women to escape from Islamic regime with dignity and pride instead of marrying off to someone they hop in the plane with. In lieu of political and legal protection for oppressed Muslim women, being a mail order bride as their last alternative to flee the Islamic tyranny should be considered a compliment, not a disgrace. Please note that being successful in becoming a mail order bride is not an easy task. I hear the competition is fierce now and that the supply super-exceeds the demand. I am just saying the big problem with these women is that they lie, big time! And I can’t stand it and I am baffled at how Dr. Holakouee is able to calmly confront them with reason. I am really fed up with these women’s lies. Why can’t they just say, I married him (or the a…hole in many cases-sorry I am just being honest) because I so desperately wanted to get the hell out of Iran. What is wrong with saying that? It’s the truth and a common practice in our community for the past three decades. So let’s just be honest about this one little thing, OK? I recently heard one caller (who knew her husband for a week prior to their wedding and shipped to the states three months later) say that they have absolutely no issues except one little problem. The husband regrets being married! In other words, he wants to return the merchandise. Supposedly, the husband didn’t like the responsibility but if he did, then he’d choose her to be his wife. At least he is being honest about his own self-deception. Why can’t she do the same? I mean, she went on and on and on about how others may have caused their marital problems and that she loves him and is willing to tolerate everything and be a good wife and so on—nothing but more lies.